How to sell scrap metal for money? Where to look for scrap metal? 1. Look in your garage or basement. 2. Check in your neighborhood for discarded metal by the side of the road. 3. If you are holding on to old auto parts, those can be sold as scrap metal. 4. An old lawnmower has lots of metal parts and can be sold as scrap. Just make sure you empty the fuel tanks before you put it up for sale. 5. Yard sales are a good place to score some scrap metal for cheap. 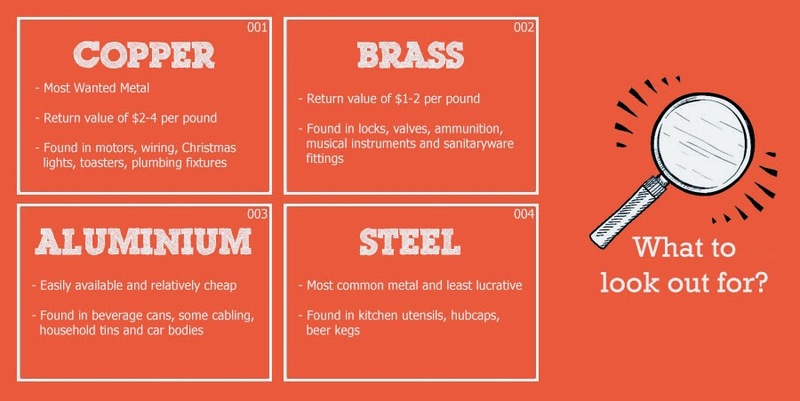 Copper- Copper is the most valued scrap metal. Almost any metal recycling yard will accept it, depending on its condition. When copper is recycled, 100% of the metal is recovered. You can scrap motors that have copper or even copper wires. Old Christmas tree lights contain copper. And so do old toasters with their copper wiring. Old-fashioned or industrial plumping fixtures were also made of copper. Brass- Recycling alloys like brass can also prove valuable. Brass can be found in gears, locks, valves, musical instruments and ammunition. Aluminium- Aluminium is easily available as beverage cans, car bodies and tins. It is relatively cheap to sell as scrap. Steel - Steel is the most common metal to scrap but the least lucrative. It can be commonly found in kitchen utensils, hubcaps and beer kegs. By doing these two things you significantly reduce the word the scrap yard has to do to recycle the metal. For that, your scrap metal could be bought for more. Step 2: Find a transport vehicle. If you are carrying small quantities of scrap metal you can even use a bicycle to transport the scrap to the recycling yard. But if you are transporting huge quantities of scrap, then a pickup truck with an open back is your best option. Scrap metal in an open pickup truck can be easily unloaded by a crane. If you take your scrap metal in a closed vehicle, then you might damage your car's interior while unloading the scrap. Step 3: Negotiate for a good price. Compare prices of the metal you are selling beforehand. You can either research it online or call up different scrap yards in your neighborhood and ask them their prices. Scrap yards usually pay more for larger quantities of scrap. Also in some areas, scrap metal fetches more during colder seasons. The easy answer for this is scrap yards. But this question will deal with how to go about finding a scrap yard and sell your scrap? There are a few steps to this. 1. First, find a local scrap yard. You can look in your local classifieds book or do an internet search. Search for "scrap yard your-location-name" or "metal recycling your-location-name". 2. Different scrap yards buy different kinds of metal. 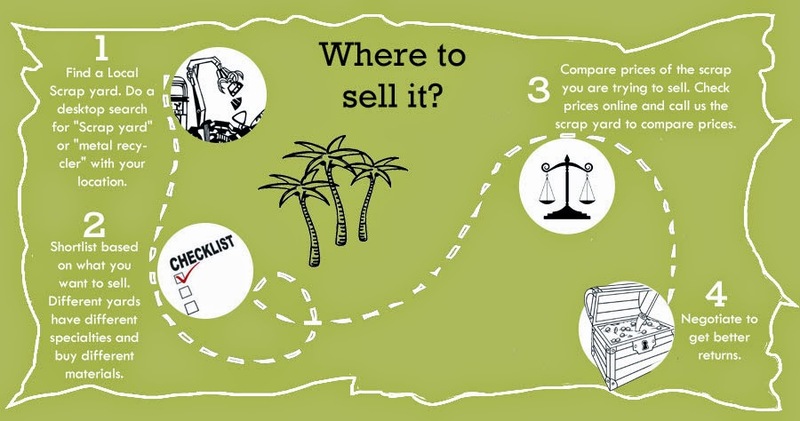 Shortlist the scrap yards based on what you are selling. 3. Compare prices before you visit the shortlisted scrap yards by calling them and asking how much they offer for the metal you are selling.